Election Update: How Big Is Hillary Clinton’s Lead? Here’s what we know: Hillary Clinton is leading in the race for president, and she’s made meaningful gains since last week’s presidential debate. Clinton is currently a 72 percent favorite in our polls-only forecast, up from 55 percent just before the debate. That corresponds to a roughly 4-percentage-point national lead for Clinton, about where the race was as of Labor Day — before a series of mishaps for her in mid-September. Our polls-plus model, which blends polls with an economic index and generally produces a more conservative forecast, has Clinton with a 69 percent chance instead. This makes for a pretty darned clear difference. 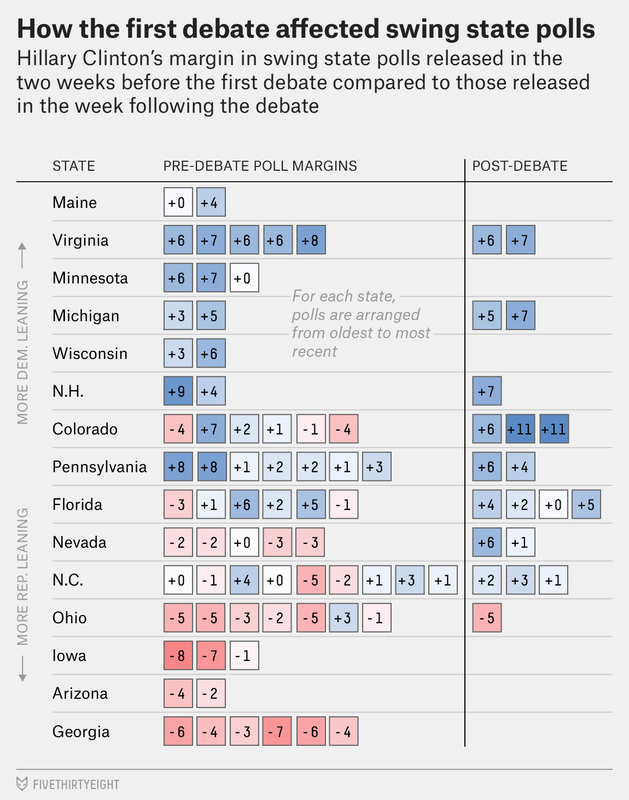 In the set of pre-debate polls, Clinton was barely ahead. Out of 67 polls, she led in 34, trailed in 29 and was tied with Trump in four. That’s why our model had Trump drawing the Electoral College almost — but not quite — to a tie before the debate. We had a lot of data, much of it from high-quality pollsters. Clinton’s leads in potentially must-win states, such as Pennsylvania and Colorado, were tenuous. And she wasn’t clearly ahead anywhere else, although Florida and North Carolina were tossups. It wasn’t quite enough to make Clinton an underdog, but it was getting close. But Clinton’s advantage in the post-debate data is just as clear. Out of 20 post-debate polls in swing states, she’s led in 18, trailed in only one (today’s Quinnipiac poll of Ohio) and was tied in one other.2 Overall, the post-debate polls look a lot like the results that President Obama had against Mitt Romney in the 2012 election, although with Ohio and North Carolina flipping sides. (Iowa is a good candidate for Trump also, but it hasn’t been polled since the debate.) That isn’t a coincidence, since Obama beat Romney by 3.9 percentage points in 2012 — right about where our model has the Clinton-Trump gap now. To be clear, our model uses a more complex process than this to make its forecasts, one that relies heavily on intra-poll trend lines. (Did Clinton gain or lose ground from the previous version of the same poll?). But it’s almost always reassuring when a complex process produces about the same answer as a simple one. Speaking of trend lines, I’d remind you to be careful when examining them. Our model’s hypothesis is that Clinton has gained 2 to 3 percentage points since just before the debate, possibly with some upside on top of that based on events since the debate. Coming late in a close race, those 2 or 3 points are enough to improve Clinton’s odds quite a bit. (Think of an NBA team that sinks a clutch basket to go from a 2-point lead to a 4-point lead late in the game; its win probability improves a lot.) But Clinton’s post-debate gains are also not on the order of her convention bounce, which was something like 8 points instead — large enough to show up in almost every poll. Thus, you can find some polls where Clinton has gained as many as 7 points since the debate, but others where she hasn’t moved up at all — and even one or two where she’s lost ground. All of this is pretty normal. Certain polls are also “bouncier” than others. As a general rule — there are exceptions — traditional telephone polls show more movement than online or automated polls. Those traditional phone polls had some of Clinton’s worst numbers pre-debate, but they tend to show some of her best results now. Although there was a small flood of polling data late Monday afternoon, polling was sparse late last week and into the weekend. Thus, we don’t know as much about whether Clinton is still gaining ground or whether her post-debate bounce has peaked or even begun to decline. Our now-cast, however, which weights recent data more heavily, shows Clinton with a slightly larger lead (4.6 percentage points) than the polls-only model (3.8 points). That suggests she probably has more upside than downside, especially given that Trump has had a terrible series of news cycles that may not yet be fully accounted for by the polls. The best evidence against Clinton still gaining ground is probably from the various daily tracking polls, which mostly haven’t shown Clinton’s position improving over the course of the past several days. All of this detail might seem like splitting hairs, but it’s important. If Trump manages to keep his deficit to 3 or 4 points heading into the second presidential debate on Sunday, his probability of a comeback will be a lot better than if he’s down by something like 5 or 6 points instead. In recent elections, we’ve seen several shifts of 3 or 4 points late in the race, but not many of a larger magnitude than that. That’s not to say Trump’s position would become impossible. But in order to lose the race, Clinton might need multiple things to go wrong (say, a bad second or third debate and a disappointing turnout on Election Day) instead of just one — which puts her in a much safer position today. Exceptions: There are a couple of polls that straddle the period before and after the debate; I don’t include these. I also don’t include state-level results from the 50-state tracking polls conducted by Ipsos, Google Consumer Surveys and CVoter. Our model uses this data, but those polls aren’t quite the same as regular state polls and so it assigns them a lower weight. An Opinion Savvy poll of Florida, although technically she led in that one too if you go to the decimal point. This was true of the set of polls Quinnipiac published on Monday. They showed roughly the same numbers they did in their previous round of polling in the same states in late August and early September, although with a gain for Clinton in Florida and a gain for Trump in Ohio.